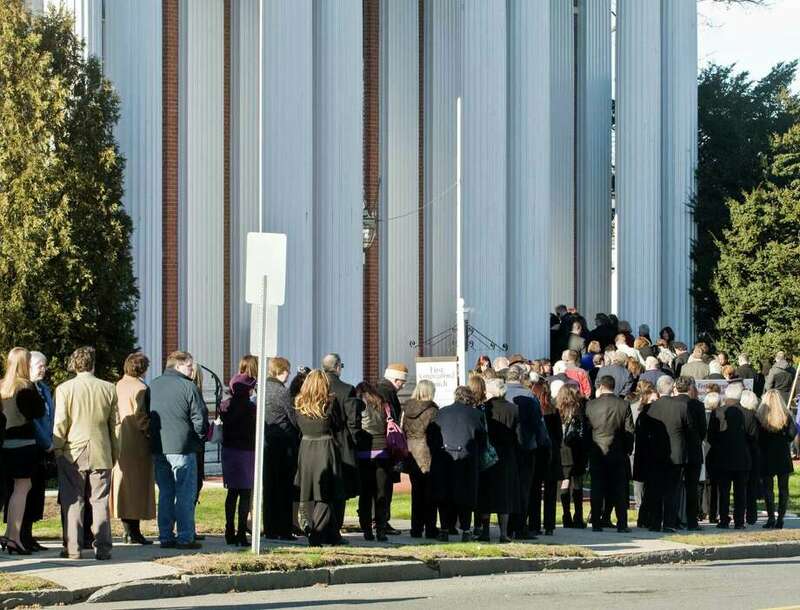 DANBURY -- Lauren Gabrielle Rousseau lived "a life that was all too short but that touched so many," the Rev. Pat Kriss told an overflow crowd at First Congregational Church on Thursday. Friends repeatedly used the word "angel" in remembering Rousseau, 30, a teacher and victim of last week's mass shooting at Sandy Hook Elementary School in nearby Newtown. They called her "an angel here on Earth," recalled the angel smiley-face she used when sending instant messages, and took comfort in the thought of her in fully grown angel wings, "so you can fly your little ones to heaven." "Thank you, Lauren, for being a faithful, thoughtful, ridiculously fun friend," said one. The mourners took more than an hour to file into the historic church, with many of them stopping to greet, hug and cry with family members. They lined the back of the church and others listened through the doors outside. The 45-minute service began with the song "Jesus Loves the Little Children," a poignant recognition of the 20 children slain at the school where Rousseau had only recently begun teaching. A family friend, Rick Cipot, read several scriptures, including Psalms 23. Rousseau's boyfriend, Tony Lusardi III, joined friends from her early childhood through her college days at the University of Connecticut in recalling her as a diligent worker whose smile made even the hardest task easier. Afterward, the Rev. Jennifer Gingras, senior pastor at Monroe Congregational Church, remembered Rousseau from the many summers she volunteered at the church's annual Strawberry Festival. "We're all just feeling so emotional," she said. "I hope everybody can just feel peace and love. In difficult times like these, love is the answer."